Nick Hardy at Classic-charters.com tells me he’s signed a motor yacht for charter with impeccable royal connections, the 25m Stalca. She was built in 1971 for Prince Rainier of Monaco and Stalca is the abbreviated Christian names of the three children of Prince Rainier and Princess Grace: STéphanie, ALbert and CAroline. Now flying the Spanish Flag, Stalca is based in Palma de Mallorca and holds a full Spanish charter licence. She charters for €20,760 per week in high season and €16,950 per week in low season. 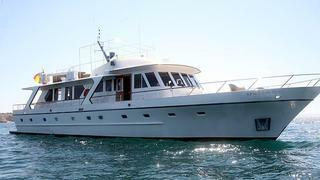 When chartering in Spanish waters 18% VAT is payable on the charter cost.